Today I'm going to take you along with me on yet another leg of the The Wisconsin Journey. And lest you think that all Wisconsin Journey stories are sad, I am hereby going to tell you a funny Wisconsin Journey story. Well, at least it was funny to me. Last Thursday night, I was at Mom's house and I needed to borrow a car from someone to run an errand. I was going to use Debbie's car until I realized that it didn't have an automatic transmission. I have driven a manual transmission once or twice in my life, and it was not pretty. The only other vehicle remaining at the house at that particular moment was my nephew Ben's car, which looks like THIS. Do you see the spotlight near the driver's door side mirror? Do you see the black painted hubcaps? 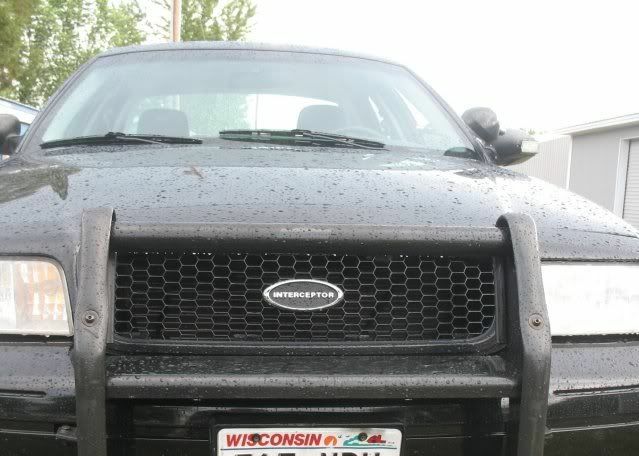 Do you see the bar "thingie" over the grill? Do you see that the front of the car says, "Interceptor?" 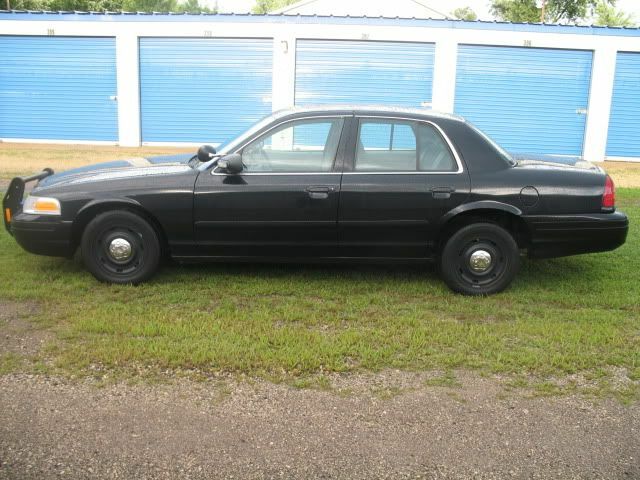 Did you notice that it's a Crown Vic? Do you think that the vehicle looks like a former police car? Well, it IS a former police car. It is a car that just SCREAMS, "This vehicle is only to be driven by a person who is young, cool and male." It does NOT in any way, shape or form scream, "This car should be driven by a 47-year old, semi-stodgy, carb-inhaling, pastor's wife from North Carolina." I went outside and stared at the car. It stared back at me from behind its menacing, police car headlights. My brother, Mark (Ben's dad), came out to observe the staring contest. After a few minutes he said, "I bet you're too dignified to drive that car." I thought to myself, "Yeah. I really don't have any strong yearning to drive a souped up Interceptor with black hub cabs around town." But then I thought, "What could be better in life than to prove a big brother wrong?" So I said to him, "Of COURSE I want to drive this car. Throw me the keys!" Once he got over his shock, he passed the keys over to me. I managed to get behind the wheel without too much drama and get the car started. I could see out of the corner of my eye that Mark was still smirking happily at the thought of his introverted, dignified little sister even sitting in that macho car, let alone driving it. The thought flashed through my mind in an instant and I knew it was the absolute perfect thing to do. Because how often does one get to step briefly outside ones' persona and do something unexpected? I knew that Mark was expecting me to slowly creep out into the street and drive away with a dainty dollop of delicate decorum. Well, first of all, I shifted into neutral and revved the engine a few times. Loudly. I glanced out of the corner of my eye and saw Mark grinning in delighted disbelief. And then? Well then, I slammed the car into drive and squeaked the tires as I pulled out! I was so proud of myself. What other pastor's wife do you know who was out last Thursday night, squeaking the tires on a Crown Vic Interceptor with black hub cabs? After my impressive "squealing away departure," I drove (a little more sedately) for a couple miles to a nearby convenience store. As soon as I pulled in to the parking lot, it was clear that a couple guys had noticed my arrival. They stared at the car. Then they stared at me. Then they stared at the car again. I could hear their thoughts as easily as if they had shouted them out loud. "WHAT in the world is THAT woman doing driving THAT car?" You know what? I was asking myself the same question. But it was still a really fun thing to do. Here I am, trying to put on my serious, tough, cool expression. Are you intimidated yet? And just so you know that Ben comes by his love of "interesting" cars naturally, here's a look at the back of Mark's car. Yessiree. 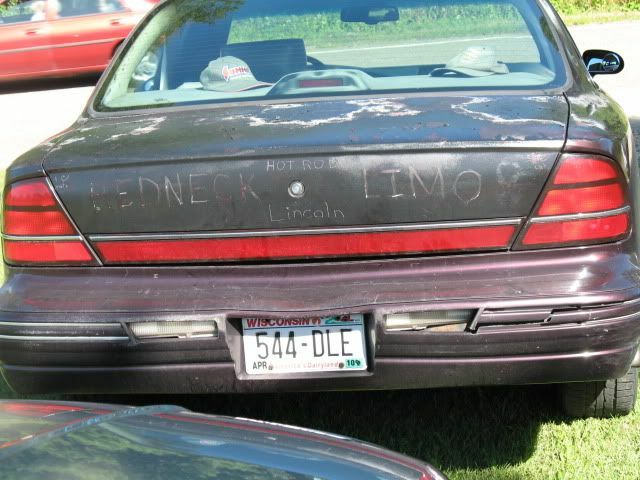 My big bro drives a Redneck Limo and Hot Rod Lincoln. And guess what? I am now an honorary member of "Mark and Ben Club," since I, yes even I, have morphed from a mini van mama into a redneck woman! Well, at last I was a redneck woman for a few minutes. Today, however, I'm back to my mini van. Alright, let me put aside my redneckedness for a moment and talk about some other things . . . This morning I sat and read and re-read all the comments that you all have left in recent days. I've been comforted, challenged and inspired by hearing your stories and experiences. Thanks to each one of you who has shared a piece of your heart on this site. I LOVE hearing from you! I think that today I may actually get out of my pajamas and attempt to get on with my life. I'm a little behind the eight ball in getting Sarah started with school since the last couple weeks of life have been a bit challenging. So today is crunch time. Whether I feel like it or not, I will do the mound of paperwork that has to be done and get Sarah going on her placement tests. The school she's enrolled in officially starts on September 3rd, but they said we could start a little later than that, due to our unexpected travel and the funeral. Hmm. I think I could write a song about that, in "Annie" style. Groan. Yes, I know that was bad. I'm confused. So what else is new, right? I thought you were home-schooling Sarah? So what's this school she's enrolled in? Has chemo brain taken over again and pilfered my memory? Or am I just stupid? All rhetorical questions except for the school one. Don't feel you have to respond to the others. I am painfully aware of the answers. "One of the great themes of Christianity is triumphant hope. Not just hope as in a distant, vague dream, but triumphant hope the kind of hope where all things end right. In midst of the struggles and the storms and the sufferings of life, we can advance our thoughts beyond today and see relief...triumph...victory. Because in the end, God does indeed win." Advance your thoughts beyond today. Not in fear. Not in uncertainty. But in assurance that with God all things are not only possible, but promised. 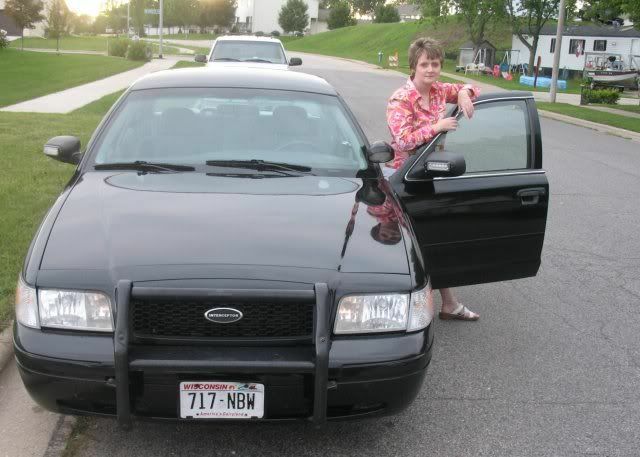 Becky ~ I've heard that people that buy old police cars actually end up driving slower because the people in the car(s) in front of them think they are being followed by an undercover police car so they drive at or below the speed limit. Did you discover this when you were driving? Sue G ~ Thanks for sharing the quote! It is so worth remembering! Yes, Sue G. - thank you for hijacking the site and posting the quote - it is very relevant to some situations in my life right now. Becky, sometimes what a "jammed up" mind needs to "unjam" it a little is a specific mental task - such as getting Sarah's school program set up - it will divert the rambling thoughts and force you to focus on the specific job at hand - and an important one, indeed. And, like Sue G. said (my, Sue G. is wise, isn't she? - I mean that with all sincerity) it will help you advance your thoughts beyond today and you will be pleased. As an aside, tattoos would be an interesting visual, for sure. I love the cop car story. You have guts, I told you that! So just to put a spin on your "macho" outlook for that car...did you ever think that maybe the police officer that drove that car before your nephew got it was perhaps a woman who could have possibly been the wife of a preacher? I'm just saying it could happen! :) I'm glad your getting the ball rolling with Sarah's school! The two of you are going to have so much fun schooling together! Good luck and God bless! Did people drive more carefully or slow down as you drove the car?? That would have been funny thinking it was a police behind them. You'd make a great undercover cop!!! Snce reading this, I have tried to imagine Mr. T, in a volkswagon beatle. Nuff sais! I felt real uneasy when I drove my brother's "vette" home from Greenville, NC, when Daddy was in the hospital in June. It was automatic or I couldn't have done it. After driving it for 1 1/2 hours I decided I might like one but not the insurance. Next week I plan to return to my volunteer work on Tuesday and Wednesday. Time to get life back to somewhat normal state if that is possible. I have been "on hold" since May 7 so it is time. I find having other responsibilities have helped--today I went to church and typed the bulletin for Sunday for the first time in a month. We do not have a secretary and I have been doing the bulletin since the end of May. It did help me to get out and involved in something different. Sarah's schooling will help, Becky. Good night to all.